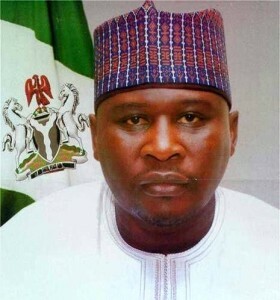 A Federal High Court in Abuja on Thursday ordered the remand of a former Acting Governor of Adamawa State, Umaru Fintiri, in Kuje prison, Abuja, over five counts of money laundering charges involving about N1.9bn preferred against him by the Economic and Financial Crimes Commission. Justice Ahmed Mohammed made the order after Fintiri pleaded not guilty to all the five counts on Thursday. The EFCC arraigned Fintiri along with Mayim Constructions and Properties Limited (the second defendant). ‎Shortly after Fintiri pleaded not guilty to all the charges, the court heard his bail application but adjourned till Friday to deliver its ruling on it. Justice Mohammed ordered that the former acting governor be remanded in Kuje prison pending when the court would deliver ruling on the bail application on Friday. ‎In the charges numbered FHC/ABJ/CR/131/2016, and filed on June 16, 2016, the EFCC alleged that the accused committed the money laundering offences involving an aggregate sum of about N1.9bn between October 2, 2014 and July 2015. ‎In counts 1 and 2 Fintiri was accused of indirectly disguising the origin of total sum of N220m (N80m and N120m) on October 2, 2014‎. He was said to have committed the offence in the two counts by transferring the various sums of money from account number 0313000301 with Ecobank Plc and operated by Timeplex Nigeria Limited into the account number 5742019591 domiciled with the same bank and operated by Mayim Construction and Properties Limited. He was also accused of committing similar offence in Count 4 by indirectly concealing the origin of the aggregate sum of N550m on October 9, 2016. But in the said count 4, the accused was said to have indirectly disguised the sum of N550m through ‎”a term loan of 12 months” purportedly granted to him by Ecobank Plc “for the acquisition of a tea plantation farm from Nigeria Agricultural Bank in Taraba State”. The former governor was said to have repaid the loan within three months while he was the acting governor of Adamawa State. In count 3, he was accused ‎of making cash payment of N220m, without going through a financial institution, for the purchase of Plot 7, Gana Street, Maitama Abuja, sometimes in July 2015. He was said to have made the cash payment to one Hashim Dikko. This was said to have violated section 1(a) of the Money Laundering (Prohibition) Act, 2012 and punishable under section 16(2)(b) of the same Act. In count 5,‎ he was accused of retaining in his US Dollars account number 5742019601 domiciled with Ecobank Plc the total sum of $4,830,000 (estimated at N970m at the then N200 to $1 official exchange rate) on June 3, 2014. The EFCC alleged that the money was part of proceeds of unlawful act of corruption and he thereby committed an offence under section 15(2), (a) of the Money Laundering (Prohibition) Act, 2011 as amended in 2012 and punishable under Section 15(3) and (4) of the same Act.